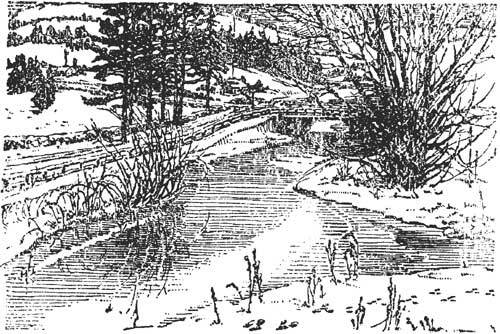 A good deal of water had run under Beulah Bridge since Letty Boynton had sat at her window on a December evening unconsciously furnishing copy and illustration for a Christmas card; yet there had been very few outward changes in the village. Winter had melted into spring, burst into summer, faded into autumn, lapsed into winter again,—the same old, ever-recurring pageant in the world of Nature, and the same procession of incidents in the neighborhood life. The harvest moon and the hunter's moon had come and gone; the first frost, the family dinners and reunions at Thanksgiving, the first snowfall; and now, as Christmas approached, the same holiday spirit was abroad in the air, slightly modified as it passed by Mrs. Popham's mournful visage. One or two babies had swelled the census, giving the minister hope of a larger Sunday-School; one or two of the very aged neighbors had passed into the beyond; and a few romantic and enterprising young farmers had espoused wives, among them Osh Popham's son. The manner of their choice was not entirely to the liking of the village. Digby Popham had married into the rival church and as his betrothed was a masterful young lady it was feared that Digby would leave Mr. Larrabee's flock to worship with his wife. Another had married without visible means of support, a proceeding always to be regretted by thoroughly prudent persons over fifty; and the third, Deacon Todd's eldest son, had somehow or other met a siren from Vermont and insisted on wedding her when there were plenty of marriageable girls in Beulah. "I've no patience with such actions!" grumbled Mrs. Popham. "Young folks are so full of notions nowadays that they look for change and excitement everywheres. I s'pose James Todd thinks it's a decent, respectable way of actin', to turn his back on the girls he's been brought up an' gone to school with, and court somebody he never laid eyes on till a year ago. It's a free country, but I must say I don't think it's very refined for a man to go clear off somewheres and marry a perfect stranger!" Births, marriages, and deaths, however, paled into insignificance compared with the spectacular début of the minister's wife as a writer and embellisher of Christmas cards, two at least having been seen at the local milliner's store. How many she had composed, and how many of them (said Mrs. Popham) might have been rejected, nobody knew, though there was much speculation; and more than one citizen remarked on the size of the daily package of mail matter handed out by the rural delivery man at the parsonage gate. No one but Mrs. Larrabee and Letty Boynton were in possession of all the thrilling details attending the public appearance of these works of art; the words and letters of appreciation, the commendation, and the occasional blows to pride that attended their acceptance and publication. Your letter bears a well-known postmark, for my father and my grandfather were born and lived in New Hampshire, "up Beulah way." I accept your verses because of the beauty of the picture that accompanied them, and because Christmas means more than holly and plum pudding and gift-laden trees to me, for I am a religious man,—a ministerial father and three family deacons saw to that, though it doesn't always work that way!—Frankly, I do not expect your card to have a wide appeal, so I offer you only five dollars. A Christmas card, my dear madam, must have a greeting, and yours has none. If the pictured room were a real room, and some one who had seen or lived in it should recognize it, it would attract his eye, but we cannot manufacture cards to meet such romantic improbabilities. I am emboldened to ask you (because you live in Beulah) if you will not paint the outside of some lonely, little New Hampshire cottage, as humble as you like, and make me some more verses; something, say, about "the folks back home." P.S. On second thought I believe James Whitcomb Riley could do it and overcome the difficulties, but alas! I have not his touch! We never refuse verses because they are too good for the public. Nothing is too good for the public, but the public must be the judge of what pleases it. "The folks back home" is a phrase that will strike the eye and ear of thousands of wandering sons and daughters. They will choose that card from the heaped-up masses on the counters and send it to every State in the Union. If you will glance at your first card you will see that though people may read it they will always leave it on the counter. I want my cards on counters, by the thousand, but I don't intend that they should be left there! Make an effort, dear Mrs. Larrabee! I could get "the folks back home" done here in the office in half an hour, but I'm giving you the chance because you live in Beulah, New Hampshire, and because you make beautiful pictures. I enclose a colored sketch of the outside of the cottage whose living-room I used in my first card. I chose it because I love the person who lives in it; because it always looks beautiful in the snow, and because the tree is so picturesque. The fact that it is gray for lack of paint may remind a casual wanderer that there is something to do, now and then, for the "folks back home." The verse is just as bad as I thought it would be. It seems incredible that any one should buy it, but ours is a big country and there are many kinds of people living in it, so who knows? Why don't you accept my picture and then you write the card? I could not put my initials on this! They are unknown, to be sure, and I should want them to be, if you use it! To the "folks back home." No folks like those back home! I gave you five dollars for the first picture and verses, which you, as a writer, regard more highly than I, who am merely a manufacturer. Please accept twenty dollars for "The Folks Back Home," on which I hope to make up my loss on the first card! I insist on signing the despised verse with your initials. In case R. L. should later come to mean something, you will be glad that a few thousand people have seen it. The Hessian soldier andirons, the portrait over the Boynton mantel, and even Letty Boynton's cape were identified on the first card, sooner or later, but it was obvious that Mrs. Larrabee had to have a picture for her verses and couldn't be supposed to make one up "out of her head"; though Osh Popham declared it had been done again and again in other parts of the world. Also it was agreed that, as Letty's face was not distinguishable, nobody outside of Beulah could recognize her by her cape; and that anyhow it couldn't make much difference, for if anybody wanted to spend fifteen cents on a card he would certainly buy the one about "the folks back home." The popularity of this was established by the fact that it was selling, not only in Beulah and Greentown, but in Boston, and in Racine, Wisconsin, and, it was rumored, even in Chicago. The village milliner in Beulah had disposed of twenty-seven copies in thirteen days and the minister's wife was universally conceded to be the most celebrated person in the State of New Hampshire. Letty Boynton had an uncomfortable moment when she saw the first card, but common sense assured her that outside of a handful of neighbors no one would identify her home surroundings; meantime she was proud of Reba's financial and artistic triumph in "The Folks Back Home" and generously glad that she had no share in it. Twice during the autumn David had broken his silence, but only to send her a postal from some Western town, telling her that he should have no regular address for a time; that he was traveling for a publishing firm and felt ill-adapted to the business. He hoped that she and the children were well, for he himself was not; etc., etc. The twins had been photographed by Osh Popham, who was Jack of all trades and master of many, and a sight of their dimpled charms, curly heads, and straight little bodies would have gladdened any father's heart, Letty thought. However, she scorned to win David back by any such specious means. If he didn't care to know whether his children were hump-backed, bow-legged, cross-eyed, club-footed, or feeble-minded, why should she enlighten him? This was her usual frame of mind, but in these last days of the year how she longed to pop the bewitching photographs and Reba's Christmas cards into an envelope and send them to David. But where? No word at all for weeks and weeks, and then only a postal from St. Joseph, saying that he had given up his position on account of poor health. Nothing in all this to keep Christmas on, thought Letty, and she knitted and crocheted and sewed with extra ardor that the twins' stockings might be filled with bright things of her own making.